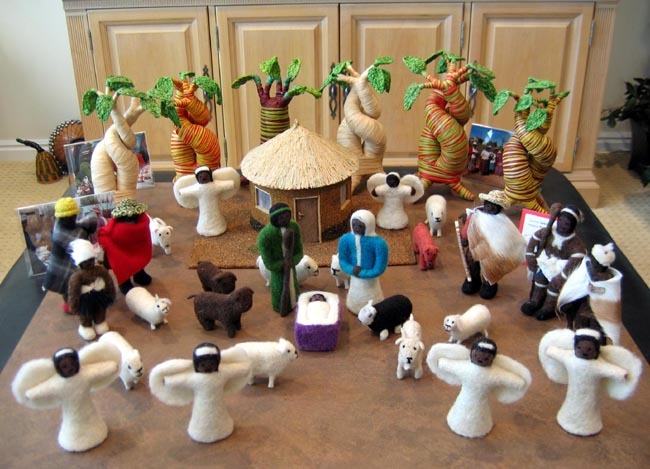 This Nativity is made from felted merino sheep wool. The set is made by a group of 15 women in Maputsoe, Lesotho. The women wash, dye, and card the wool by hand from their craft workshop. The set includes 13 pieces: Joseph, Mary, baby Jesus, an angel, a sheep, a dog, an angora goat, three villagers, and three kings. The Joseph figure measures 6 inches tall. The villager group contains two young men carrying Basotho fighting sticks; one young man wears a knitted cap while the other wears a distinctive Besotho hat. The third member of the group is a girl wearing a traditional titana skirt. The kings are based on actual kings of the Basotho people of Lesotho: King Letsie I, King Moshoeshoe I, and King Lerotholi. ​The group of 15 women was brought together through the entrepreneurial strength and determination of Mme. Matsepo in an effort to create a positive way forward for women who had been left widowed or deserted. These women, who often care for orphaned grandchildren or are in ill health themselves, were previously unable to find employment. The HIV and AIDS pandemics are claiming the lives of those aged 25 to 40 at an ever increasing rate in Lesotho. Whilst ARV medication is provided free of charge in Lesotho, the majority of those affected by the disease have very poor nutrition which makes the medication ineffective. Lesotho and South Africa also have the highest rates of tuberculosis in the world, so many patients affected by HIV and AIDS contract TB as well. This Nativity project provides needed income for better nutrition to combat these diseases. The project also gives these women huge hope and inspiration for a better future.